Nothing fancy, but absolutely tasty! 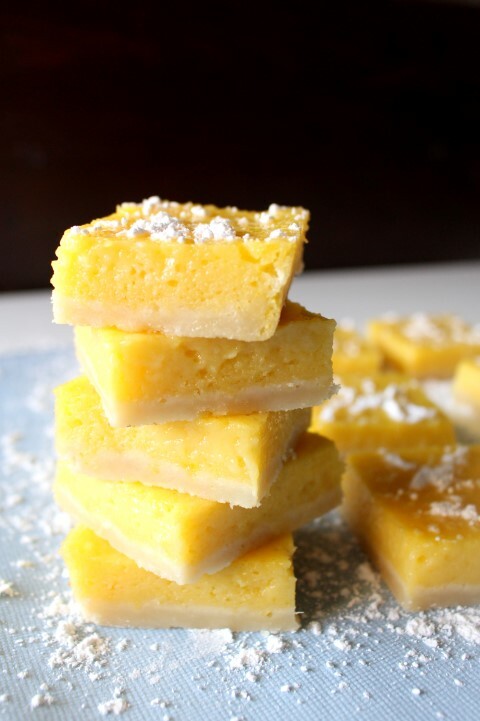 They are very similar in consistency to a lemon bar. Feel free to leave off the coconut and use a simple dusting of powdered sugar instead. Preheat oven to 350 F. Grease and flour a 9 x 13 inch baking pan. In a medium bowl, mix together 1 and 3/4 cup flour and powdered sugar. Cut in cold butter with a pastry blender until the mixture resembles coarse crumbs. Press the mixture into the bottom of the baking pan. Bake for 8-9 minutes or until the crust is lightly browned. Let cool. Meanwhile, beat together eggs and granulated sugar. Stir in lemon juice and mango puree. Lastly, gently stir in 1/2 cup flour. Pour mixture over the crust. Reduce heat in the oven to 325 F and bake for 22-25 minutes or until set. Let cool and refrigerate at least 2 hours before cutting bars. Dust with powdered sugar and sprinkle with toasted coconut. * to make the mango puree, combined 2 cups diced mangoes, 1 Tablespoon water and 1 Tablespoon granulated sugar in a small saucepan. Bring to a simmer over medium low heat and simmer for 10 minutes. Remove from heat and let cool. Process in a blender until smooth. 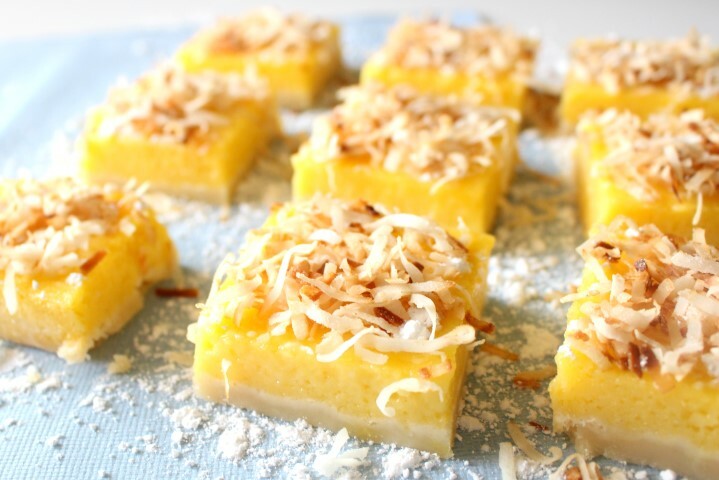 I am crazy about toasted coconut – love that part Mallory! Love the mango lemon combination! These look great! I love the combination here! Brilliant! Love mangoes! Love lemon. Love coconut! Guess I have to make these then. It’s just meant to be! Maybe I’m missing it because I’m looking on my phone, but where does the asterisk after “mango purée” in the ingredient list lead? Now there’s an explanation for how to make mango puree at the bottom of the recipe. Thanks for the heads up! It’s the taste of the Caribbean in one bar. Sign me up. Yummo. Thanks, Lisa! No plane ticket needed! As far as I can see there’s only one issue with these bars – they look addicting!!! GAWSH How oh how did you not eat them all – in one sitting or one sniffing!!! I am pinning this for the next time I have mangoes. 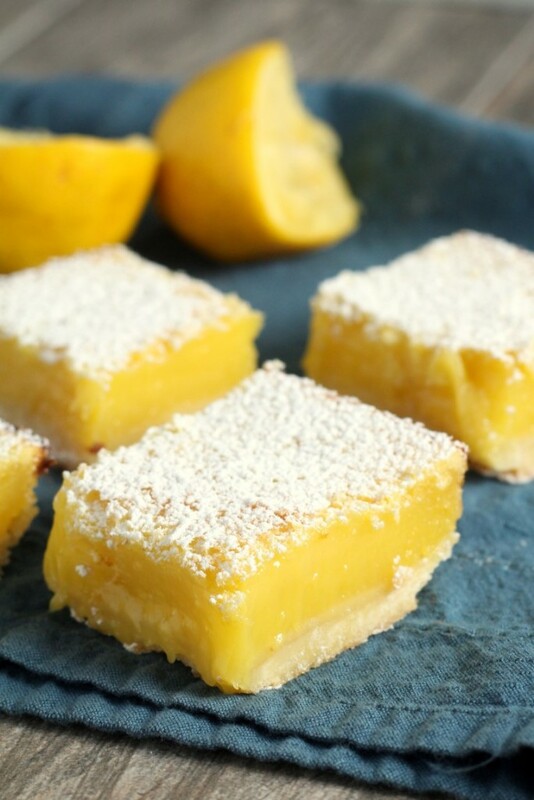 We adore mangoes and lemons around here (and treats! ), so this is a sure win! In the oven right now hoping it’s will be good and it’s will work. Look great in the photo. Love lemon and mango. Really really good. Love the mix with the mango and the lemon. Just the crust is a bit hard but that the only negative point. Love the flavor. About the toasted coconut: I’m presuming you have to toast it yourself, as I don’t recall seeing toasted coconut available on the shelves at the grocery store. So…what temp, and for how long? Also, is it supposed to be sweetened or unsweetened coconut to start with? I don’t bake much with coconut so its ways are still mysterious to me. 🙂 The recipe looks fantastic, though. I can’t wait to try it out. Yes, you will need to make your own. 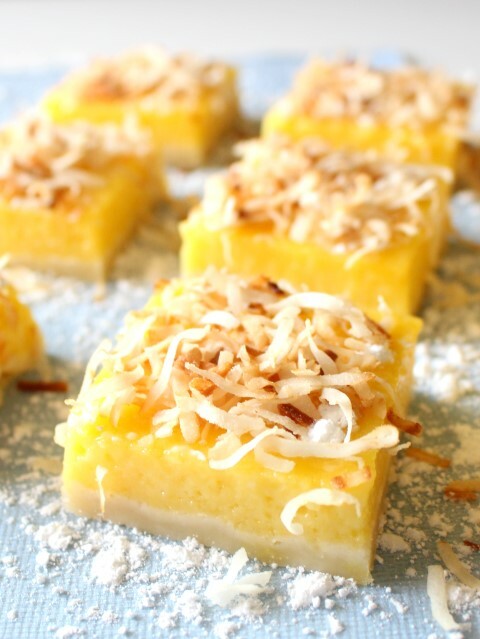 Until this recipe I had never toasted coconut either. There are some really great tutorials out there if you google how to toast coconut. Thanks Mallory! I did end up giving these a go, and they were delicious. One thing I found, though, was that mine still weren’t quite done after 27 minutes in the oven. They also started to taste a bit eggy after a couple of days. So I’m curious: do you think I could get away with using four (large) eggs instead of the called-for five, or would that be likely to throw the whole thing off? Did anyone try this with frozen mango?? I’m wondering if it will throw off the consistency. Thanks!! 1 and 1/2 sticks of butter is the equivalent of 3/4 cup. Probably as long as it is smooth. I’d love to know how it goes if you try it.